Don't fret over finding the perfect wristlet for prom or your next formal occasion. 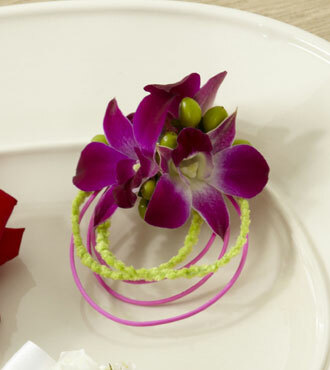 This elegant and exotic wristlet combines the beauty of purple dendrobium orchids with green hypericum berries to create a simple and striking accessory. Bright green chenille deco wire is carefully wrapped around the flowers and greens to create a sophisticated and elegant wristlet for your next big occasion.